This course will study learning and memory and how the brain processes information for memory retention and retrieval. The anatomy of the brain and how brain cells function as well as chemical reactions that facilitate the memory and learning process are explained. 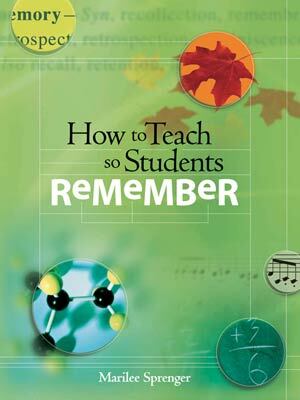 Teachers will learn about the different types of memory, such as semantic, location, emotional, episodic, and procedural and location memories Educators will evaluate their teaching methods and apply brain memory and learning strategies for improving student achievement. Students will develop a writtings, lessons or activities for classroom applications to help students remember curriculum content. Educators will learn how to reach students so they can be taught specific subject content utilizing background knowledge and memory reflection. Teachers will explore how to reinforce content for memory retention and recode self-generated information to improve memory recall. Educators will review content reinforcement strategies the include student feedback and the discussion processes that reinforce learning and memory. Teachers will examine reviewing and practice techniques that reinforce information knowledge and retention for faster and easier content retrieval. Teachers will develop writings, lessons and activities to apply the seven "R's" of memorization into their classroom instructional practices.